Please read the FAQ’s below for more information. What is the Community Trigger / ASB Case Review? The Review has been introduced to help ensure that agencies are working together to resolve incidents of anti-social behaviour that are affecting residents quality of life. We will do this by appropriately sharing information between agencies, reviewing the actions that have been taken and use available resources to try and reach a solution and make recommendations that will hopefully prevent the situation from reoccurring. The Review does not replace the existing complaints procedures of individual organisations, or your opportunity to complain, when appropriate, to the Local Government Ombudsman or Independent Police Complaints Commission. When can I use the Community trigger / ASB Case Review? The Community Trigger/ASB Case Review can be used if you have reported at least three incidents of anti-social behaviour to a relevant organisation within the previous six months. These are incidents where the same behaviour, nuisance or problem has reoccurred and was reported within one month of it happening. For the purpose of the Community Trigger/ ASB Case Review, an incident of anti-social behaviour is defined as behaviour causing harassment, alarm or distress to a member, or members, of the public. This could include behaviour such as vandalism, public drunkenness, noisy or abusive neighbours. The Community Trigger/ASB Case Review is not designed to replace existing anti-social behaviour reporting lines or for the reporting of general acts of crime, including hate crimes. How do I use the Community trigger / ASB Case Review? To use the Community Trigger/ASB Case review you should click the link above to complete the online form. You will need to provide details of the date of each incident that you have reported, to who (name, organisation and/or Incident Reference Number – if available) and information about the anti-social behaviour incident you were reporting. By completing an application you agree to allow your details and information about you to be shared with other agencies. The Review can also be used by any person on behalf of a victim, for example, a family member, friend, carer, councillor, Member of Parliament or other professional person. However the victims consent will be needed before a person can use the Community Trigger/ASB Case Review on their behalf. To date, there have been 12 Community Trigger /ASB case review applications. Once a Community Trigger/ ASB Case Review application has been received and accepted, the Community Safety Unit will contact the other agencies involved to confirm the details of the reported incidents to verify the threshold has been met. You will be contacted to confirm that the Trigger threshold has been met or if it has not been met what action will be taken to deal with the issues raised. Following validation of the threshold, the Community Safety Unit will request that agencies provide complete details of the case and any actions that have been taken to resolve the issues reported to them. Arrangements will be made for a review panel to be formed who will then carry out a case review. The panel will involve senior staff from the appropriate Community Safety Partnership agencies, the Registered Social Landlords and/or other partners that may have been involved. The panel will discuss the anti-social behaviour and the actions taken. The relevant bodies who undertake a case review may make recommendations to other agencies. The legislation places a duty on a person who carries out public functions to have regard for those recommendations. This does not mean that they are obliged to carry out the recommendations, but that they should acknowledge them and may be challenged if they choose not to carry them out without good reason. We will report the number of Community Trigger/ASB Case Review applications and provide a summary of the key findings to the Kent Community Safety Partnership Executive group and the Office of the Kent Police and Crime Commissioner. 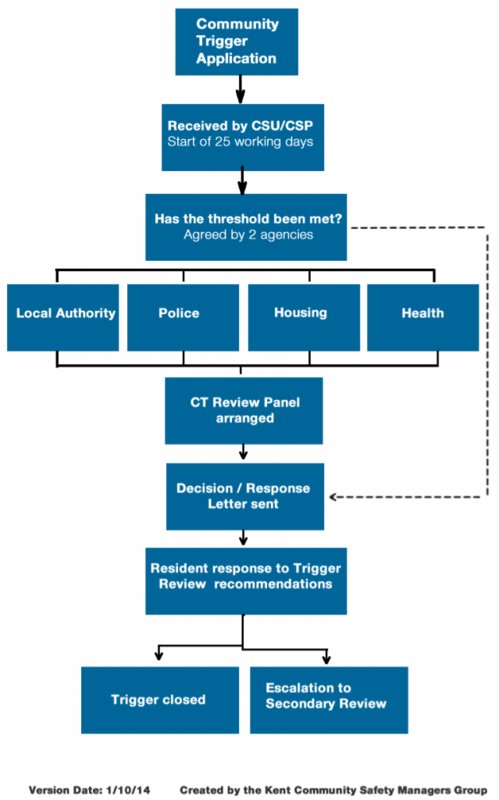 If you are unhappy with the way your community trigger/ASB Case Review application has been handled or the way in which the review panel was conducted then you can request that a secondary review be carried out by an independent panel. The secondary review is the last step that can be taken in this process, if you are still unhappy you will be directed to the relevant organisation’s standard complaints procedure.